‘Solidarity Line’ uses the bodily formation of the defence line, that instead of defending territory, becomes a transient line – a moving border, a living architectural element. 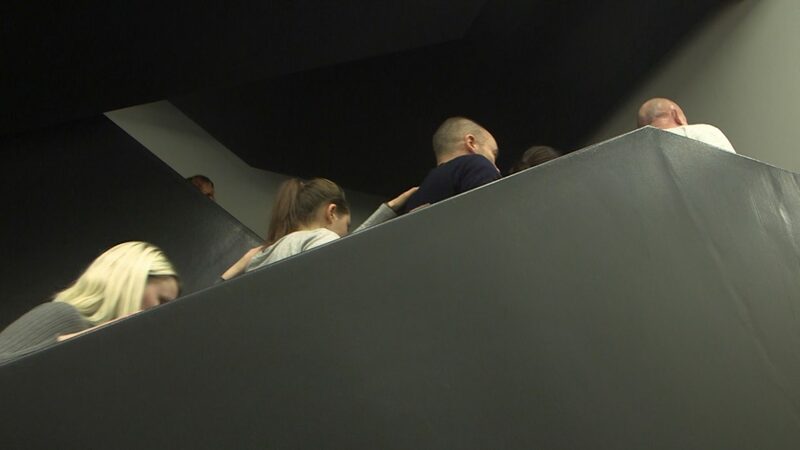 The participants, without speaking, draw on an attentiveness to each other and the environment, navigating through the circulatory spaces of Tate Modern by collective intelligence. Individuality is constantly re-negotiated according to the needs and demands of the group, and in response to built form. Staff of Tate from across the different teams including cleaning and security staff, invigilators, administrators and curators were invited to take part. The actions proposes new orders of movement that aimed to foster new relationships between the building and those who use it, and an interconnectedness between building members and their individual spheres of operation. ‘Days of Action’ event series at Tate Modern uses collective devices from civic resistance and direct democratic assembly to explore particular relations of ’them’ and ‘us’, ‘I’ and ‘we’. Architecture is exchanged for the ‘other’ (the counter protest or authority), to be negotiated not as an antagonist but as an affective force that can generate new social and spatial possibilities.